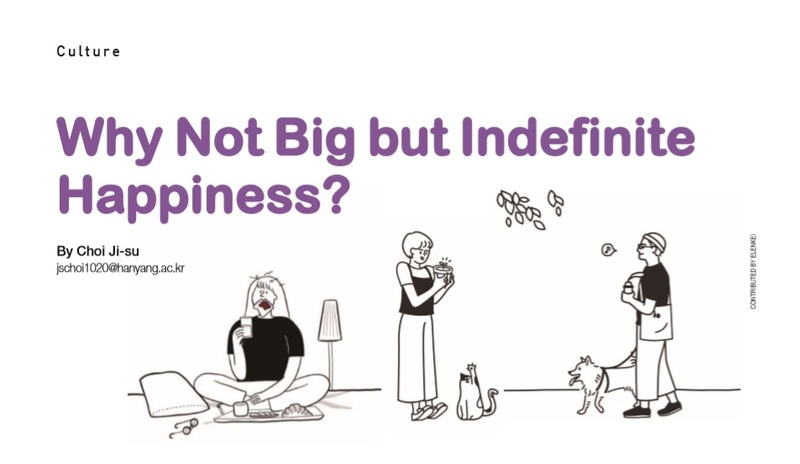 Why Not Big but Indefinite Happiness? A small piece of happiness can be eating a freshly-baked loaf of bread with your own bare hands, seeing your neatly folded underwear in a drawer, wearing a new shirt that smells like clean cotton, or having a cat get in bed with you while hearing it purr. All these things just make us feel better, which are examples of So-hwak-haeng, meaning “small but definite happiness”. Reaching a small but achievable happiness is currently trending in Korean society. The concept of So-hwak-haeng was first mentioned in an essay published in 1986: “Afternoon in the Islets of Langerhans”, by a Japanese author, Haruki Murakami. The word was coined 30 years ago and has become a cultural keyword in Korea this year. It is not difficult to pursue So-hwakhaeng. “What I’ve been doing in my daily life could be a form of So-hwak-haeng that I hadn’t realized before. Even though it is not a grand form of action, if I feel happy about giving it a certain meaning of my own, everything could be a personally defined form of happiness,” said Hong Su-in, a Sophomore from the Department of Energy Engineering. Moreover, by engaging the search for So-hwak-haeng, people have found comfort in their hearts and happiness in their daily lives even though they don’t do anything special. It is not about the extraordinary and great happiness of the distant future, but the pursuit of the ordinary and simple happiness that one can feel at the current time. It is certainly good to find happiness in our daily lives but there is a bitter story of the Korean society behind this positive trend. 30 years ago, when So-hwakhaeng first appeared in Japan, they were a typical low-growth society, similar to Korea today. This trend did not mean anything to young people in Korea back in the 1980s, but now Korea is a typically competitive society like in the past Japan, which makes it very difficult for young people to achieve anything, living in such fierce conditions. The continuing depression and polarization results in employment difficulties and leads to the ‘n-Po generation’: a generation that gives up in various fields. The emergence of So-hwak-haeng is a response to these problems in Korean society, and therefore we have become obsessed with finding forms of small but definite happiness in our daily lives. Last year, living a YOLO life was a major trend and was mentioned in The Hanyang Journal’s 335th edition. This was published just one year ago, the problems associated with the YOLO trend was addressed. However, the YOLO culture that pushed the youth to do everything they wanted since “you only live once”, quickly shrank in front of reality and became limited to one’s own small but definite happiness. Therefore, it is sad to see the emergence of So-hwak-haeng as the culture critic Kim Sung-soo explains: “Since the key message of YOLO was that you only have one life, and therefore you should do what you really want to do, So-hwak-haeng reflects the reality that you can’t do what you want to do.” Unlike YOLO, which has an adventurous personality, So-hwakhaeng comes from the resignation of young people who have decided that greed for luxury is far from their reality and that they should be satisfied and happy in their everyday lives regardless of their financial situation. It does not mean that to pursue happiness as a means of an unconditionally luxurious life is hard to achieve or different from others, but in the view of Korea’s social atmosphere, pursuing So-hwak-haeng is more something that we involuntarily choose rather than what we choose for ourselves. haeng makes us settle for the present and to rationalize our situation. Instead of seeing a big but uncertain happiness like purchasing our own homes or being employed and getting married, So-hwakhaeng makes us pursue happiness that is relatively easy to achieve and very small. If we settle for such a breakthrough, we may lose the will to challenge the cold and difficult society in the first place. In our generation, it is difficult to live as our parents’ generation did, or even to be a part of the middle class in society; a small-scale of development is being used as self-justification and protection. The anxiety such as ‘Can I do this while being uncertain of the future?’ or ‘Can I achieve this?’ makes So-hwak-haeng emerge as the tendency to find and discover happiness in its present state, and not the future. According to Professor Kim, there are certain goals that human beings want to achieve in their lives, and the fulfillment of those desires is not bad, but natural. Searching for more possibilities or for greater potential in one’s life is very essential. Of course, the process of discovering one’s possibility of achieving something and developing their potential could be difficult, but the pressure of social difficulty leads us not to be motivated in the first place. As a result, our driving force grows, and change is lost. Whatever it is that we are pursuing, it doesn’t have to be seemingly achievable or valuable, but we should satisfy the kinds of desire that is most directly related to our happiness since there are side effects of So-hwak-haeng that limits our desire to pursue in the first place. Sometimes a repetitive life cycle like a squirrel’s wheel can seem like meaningless competition, and it is true that people in their later ages, get out of the wheel and become happy. However, So-hwak-haeng is making the exit of the cycle in their twenties. Even if competition seems meaningless, in a macro-view of the society, each wheel is essential and makes the society work. However, pursuing So-hwak-haeng would slow down social dynamics. Also, it has flaws that those with vested interests are much easier to monopolize and realize their desires, since we all are only focusing an each individual’s happiness. We need to know why the society, especially Korea, is pursuing So-hwakhaeng and why it appeals to so many people. The emergence of So-hwak-haeng is a warning sign so therefore, we should stay alert about it. What Kind of Happiness Should We Pursue?